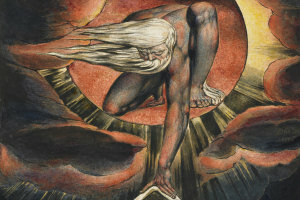 A collection of lost colour prints and illuminated books by the iconic artist and poet William Blake - potentially worth millions of pounds - is waiting to be discovered somewhere in the north east of England , according to a University of Manchester art historian. Colin Trodd - whose book about Blake is published by Liverpool University Press in the winter – says the works were bought from Blake himself possibly in the 1820s by the little-known artist James Ferguson. The academic, based in the University’s School of Arts, Histories and Cultures, says Ferguson’s collection was never found after he died – but could very well have been left in a pre-Victorian attic. He said: “James Ferguson lived a semi-nomadic life – stomping around South Shields, Newcastle and County Durham. “He would have taken the collection with him, so there’s no reason to doubt that he left it somewhere in the region. According to Dr Trodd, an unknown illuminated book entitled Outthoun is likely to be in the collection; other works include colour prints of Newton and God Judging Adam, two of Blake’s most famous works. Ferguson was by all accounts an eccentric figure, who went on to teach dentist, artist, forger and arch-conservative James Orrock who would oddly, says Dr. Trodd, have hated the radical Blake. In his book, the academic describes how Blake acquired his reputation as one of Britain’s’ greatest artists and poets after he died. He said: “Blake was buried in a pauper’s grave in 1827, but gradually gained a reputation as a great national figure, a vision endorsed by the Pre-Raphaelites, John Ruskin, and many members of the Arts and Crafts Movement. “In addition, his designs were known to leading political figures such as Gladstone and Disraeli. “In more recent times, Denis Healey, Sir Peter Parker, Jim Morrison, Alan Ginsberg, Patti Smith, Julian Cope and Billy Bragg are all known as active admirers of Blake”. “Blake’s popularity endures: he was in many ways a normal man who worked 12-hour days; he never made very much money, yet loyally lived with his wife for nearly 50 years. “Yet, at the same time, many of his paintings and designs are radical, wild and extraordinary. Some of Blake’s work is kept at the University of Manchester’s Whitworth Art gallery. Images are available.